Lucy Ann Holmes was born on 8th Nov 1860 in Birmingham, and was christened on 29th Sept 1861 at St Thomas, Birmingham, to William Holmes, a brushmaker, and Caroline née Whateley. Her mother died when she was only 7 and her father when she was 11, after which she was looked after for a time by her older sister Susannah, herself only 16. By the time of her father’s death, the remaining family has moved to Worcester, where William was born. She was still living with Susannah after the latter’s marriage, in Worcester. She married William Henry Pullen, a gardener, at St Clement’s Worcester, on 13th May 1883 at St Clement's Worcester.  See picture at this site. He was born on 18th Apr 1857 at Frooms Hill, Herefordshire, to Benjamin Pullen and Mary Ann née Bishop, and was baptised on 14th June 1857 at Bishops Frome. 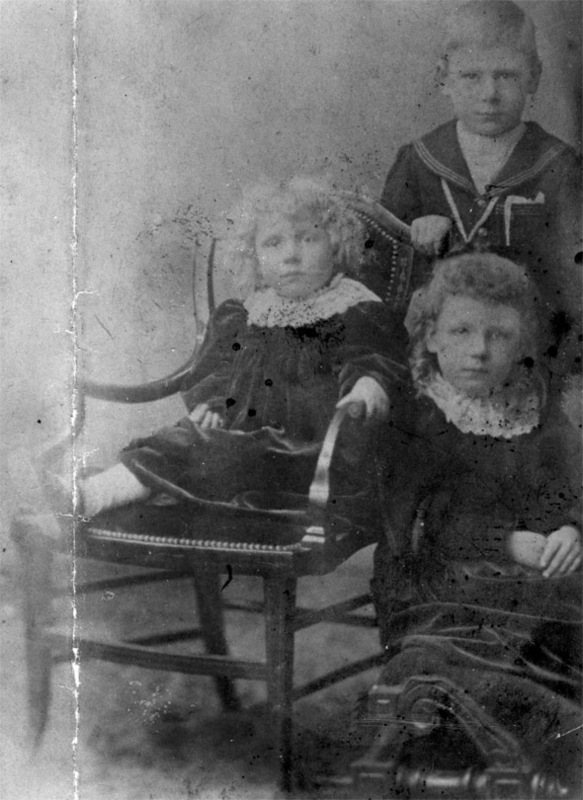 (Incidentally there seems to be no birth registration for William Henry Pullen, though my father remembers his birthday) William Henry and Lucy Ann lived first at Worcester, but by 1891 they were living at Suckley, Worcestershire. By 1901 they were at Wick, near Pershore, Worcestershire, where William became head gardener to the Hudson family, at Wick House. They lived in Dorinda Cottage. There were references to Lucy’s poor health from the early 1900’s and she stayed away at Susannah’s at least once for a period. Lucy died on 7th Nov 1906 at Pershore of a paralytic seizure. Frederick William Pullen was born in January quarter 1885 in Worcester and baptised at St Peter the Great, Worcester. He died in January quarter 1885 in Worcester district. Frederick has only just been discovered (June 2010). Picture of St Peter's here. William Henry Pullen was born in June quarter 1886 in Worcester. He was known as Will. He married Margaret Fisher in 1917 in Ashford, and maybe divorced, and had mental problems in later life. He had a prolonged stay in Ashford Hospital, when it was a workhouse, then at Tooting Bec Mental Hospital, from which he was evacuated to the north of England during the war. He apparently died at Tooting Bec Mental Hospital in July quarter 1950. He suffered from epilepsy, and twice enlisted in the army during WW1, though he was discharged each time due to his epilepsy. Will and Margaret had two children, who are not known at this stage. Florence Pullen was born on 24th April 1887 in Worcester. She was a schoolteacher before marriage in Staines. She married Edward Ernest Whitaker on 21st Dec 1912 at St. Peter's, Staines. They had one son, Edward Ernest William George Whitaker. Florence died on 24th Apr 1975 in the Reading/Wokingham district. Edward (sen) had died on 27th October 1968 in Newbury, and was buried on 31st October in Speenhamland. Ada Pullen my grandmother, was born on 4th October 1889 in Suckley, Worcestershire. She married Frederick Douglas on 6th Mar 1913 at St Michael's Cricklewood. She was a seamstress, and he was a baker. She was my grandmother, and they had five children, of whom four survived. Ada died on 12th October 1983 after a spell in a nursing home and was buried at Englefield Green, and Frederick had already died on 27th September 1953 at Ashford Hospital. See their family here. William Henry Pullen senior moved to Staines, apparently with some of his employers, between 1907 and 1911, living in Claremont Villas, Moor Lane until at least 1915. He was working at Duncroft at least part of this time (a large house which later became an approved school). He remarried a widow called Florence Ada Keefe, known as Ada, whose maiden name was Stone, in March quarter 1917 in Brentford district. 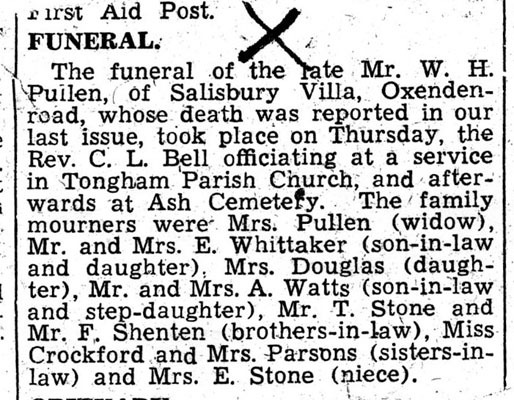 Ada had a daughter Hilda from her first marriage, Hilda married Albert Watts in July quarter 1933 in Farnham district. In 1909 William was sent by his employer John Temple Scriven, to the latter's other property, Watchfield House, Watchfield. The latter had trouble with a gardener embezzling money, and William had to see a new gardener put in place. In about 1917, William and Ada moved to Tongham in Hants. William took part in an ill fated business as a coal merchant there. William died on 24th Jun 1943 at Farnham County Hospital, and was buried at Ash Cemetery. 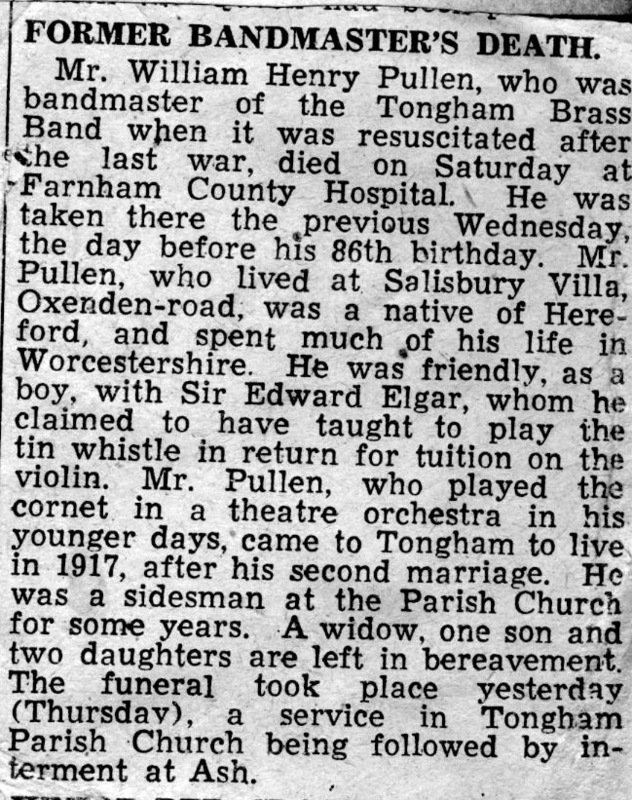 William played the cornet and was a bandmaster in Pershore near Wick, Staines and Tongham.